Thanks you for your recommendations from yesterday's piece. I've noted them on my Amazon wish list for now. But here's one from me. Sometimes on FB, I see an ad for a Kindle book. Because they know my habits, it is usually a British mystery that I've never heard of, and it's usually for the first book in a series at a bargain price. For 99¢ or whatever it happens to be, I sometimes click and buy because I don't have much to lose. In most cases I am interested enough to finish the books although they can get draggy by times. 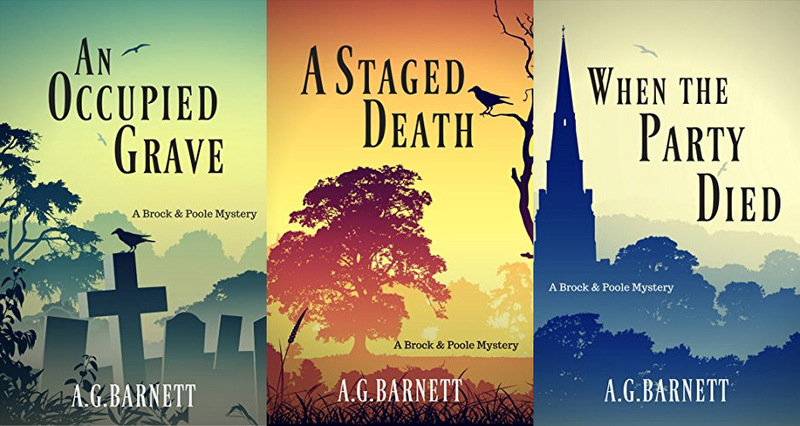 Most recently I downloaded a Brock and Poole mystery by A.G. Barnett and found that I quite liked it. Poole is a young. detective newly assigned to work with the older but hardly older cop, Brock, in a lovely English town called Bexford. I found the characters interesting, and they brought enough background dynamics into the storyline to raise interest beyond the current plot. It was an interest that could be threaded into new installments and indeed it was as I found out when I ordered the other two available novels. I liked the stories well enough to read one a day for three days and would read the next if it were published, for the background plot will continue although the most recent case in When the Party Died concluded. Mind you, I don't know at what prices I would continue the series. If the next Kindle edition were the price that I would pay for a major author like Elizabeth George, for example, I would probably pass. But for $3 or $4, I found the series to be a pretty good bang for the buck. And that's all that these novels will cost, close to $4 on Amazon Canada and $3 in the USA. One reservation is that the prose can seem a little plodding at times although I, obviously, didn't find it to be a major problem. There are also some odd turns of phrase. For example: someone can be stood in the corner rather than standing in the corner. But perhaps that is an acceptable localism. Regardless, once again, I wasn't overly bothered. What I think I am saying is that Barnett may not be the best writer of prose, but I do like the characters and the plots well enough. From a body in a freshly opened grave to a body in totem pole, I found the premises and resolutions interesting. 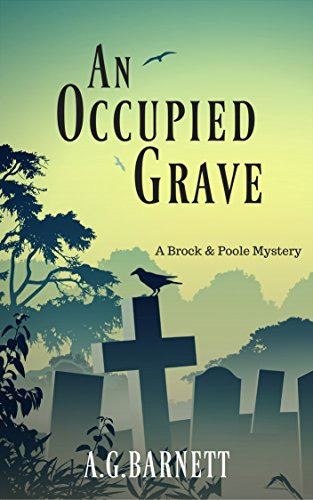 I certainly doesn't require a big investment to find out if you would or would not like Brock and Poole if you are interested in this genre and looking for a new read. I will look for them. Thanks, AC. I not a fan of male mystery writers, as a general rule! I was so sad the CP bookstore closed. Thanks! I've written down the author's name; I'm always looking for someone new to read. I just read about the thousands (tens of thousands) of work coming out of copyright and being made available for free over the Internet. Not good news for new authors. I think that's the first time I've heard of that author. Interesting. I will explore the work further. I too like mysteries, although British mysteries sometimes (as you suggest) have a "draggy" component. Thank you! How much of your fiction reading do you do via a Kindle? For me, I have had somewhat of a challenge in terms of finishing a fiction book on the Kindle. I do read a fair amount of non-fiction (mostly work related) on the Kindle, but for some reason, reading fiction is more of a challenge for me on the device compared to a paper copy. With a paper copy, I find it easier to get into what I call the "movie" mode... where the actual paper and words "disappear" so to speak and I see the story in my imagination as I read. It is much more challenging for me to get into the "movie" state on the Kindle. I tend to stay more focused on the actual words and the device. I wish this were not so, but I have not yet mastered it.